Image: An original 19th century albumen photograph. The scan of this image reflects its tones reasonably accurately. Storage Code: 0918A 105 - 150. Condition : good plus - some marks to mount. We will not send items on which this charge has not been paid - so please wait for us to invoice you. 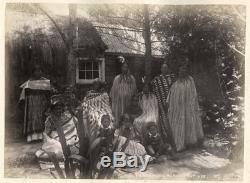 1880's NEW ZEALAND JOSIAH MARTIN'TE TAUPUA & ROTOHUA NATIVES' MAORI GROUP" is in sale since Sunday, October 14, 2018. This item is in the category "Collectibles\Photographic Images\Vintage & Antique (Pre-1940)\Other Antique Photographs". The seller is "pumpparkphotos" and is located in Downpatrick. This item can be shipped worldwide.